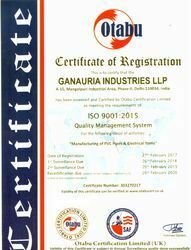 Established in the year 2016, Ganauria Industries LLP(Allwin Electric) is one of the leading manufacturers, exporters, and suppliers of quality PVC Pipes, PVC bend, PVC Conduit Pipes. 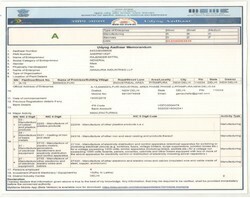 Our products are certified as per IS:9537 (Part III) of Indian Bureau Standards. 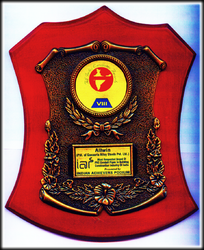 Our branded products have earned a lot of appreciated acknowledgment in the Northern part of India when it was launched in the year 1992. Our well-developed infrastructure unit is backed by various machines and equipment in order to meet the clients’ specific requirements. Quality has always been our top priority and to ensure best quality products, we conduct various quality tests such as dimension test, marketing test, and construction test. 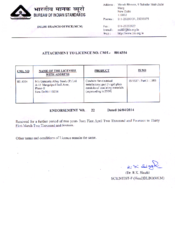 These tests confirm that our range stands at par with international standards of quality. We also owe our success to our R:D department wherein research experts conduct various research and market surveys that enable us in marking a reputable position in the market. Further, we also lay special emphasis on the proper packaging of our PVC conduit pipes and fittings so that only defect-free products are delivered to clients end. To be the most recognized & preferred brand for Fast Moving Electrical Goods (FMEG), across India and Globally. Our experienced team of experts continues to be a major asset for our organization. They work in close coordination with each other to fulfil the demands of our clients. Our team comprises technicians, engineers, R&D personnel, quality controllers, warehouse personnel and sales & marketing personnel. With the help of our professionals, we have been able to meet the clients’ specific requirements. Entire production procedures are conducted by our expert engineers under the supervision of quality controllers. Further, our team is provided regular training for making them aware of latest market trends and development in the industry. We have experienced R&D personnel who carry out regular market research keep us updated with the latest technology. 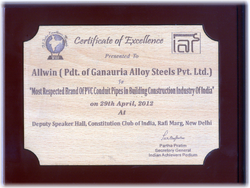 Allwin Pipes: Most Respected Brand of PVC Conduit Pipes in Building Construction Industry of India. There are many benefits of using PVC Pipes Fitting, PVC Bend, PVC Socket, PVC Conduit Pipes. It reduces maintenance, labour costs, and offers superior performance. PVC conduit is easy to install, easy to cut and join and no special tools are required. The inside of our conduit is smooth, therefore wire is not damaged when pulled through. The smooth interior surface of our conduit reduces friction when pulling conductors and wires through long runs. It is easy to pull wire and conductors, even through 90° bends. PVC conduit is approximately 1/5th the weight of steel and half the weight of aluminum, therefore making it easy to move and handle. PVC conduit can be used for direct burial, requiring no additional protection when installed. Normal construction practices should be followed with the trenching and back filling operations. PVC conduit resists attack by acids, alkalies, salt solutions and most other chemicals. Our conduit and fittings undergo extensive testing and inspection in our manufacturing facilities. 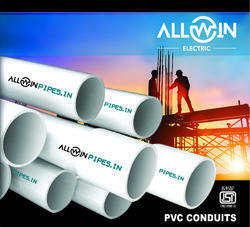 ALLWIN PVC conduit has high tensile and impact strengths at all temperatures. It meets the test requirements of ISI. PVC conduit is resistant to direct sunlight, heat and all weather conditions, even after years of exposure. It is also resistant to macro and micro-organisms, fungi, rodents and corrosive agents. PVC conduit Pipes and fittings are non-metallic therefore there is no risk of corrosion when exposed to naturally corrosive soil conditions. They will not rust or corrode from electrochemical and galvanic environments. The PVC compound used to manufacture our rigid PVC conduit and fittings is a self extinguishing material that does not support combustion. It does not burn without a flame being directly applied to it. Once the flame is removed the material stops burning. 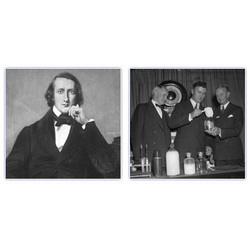 Polyvinyl chloride was accidentally discovered twice in the 19th century, first in 1835 by Henri Victor Regnault and in 1872 by Eugen Baumann. He observed that the newly created gas- Vinyl Chloride, when exposed to sunlight, underwent a chemical reaction (now recognized as polymerization) resulting in an off-white solid material. By 1938, first PVC Pipes were produced using a roll mill and hydraulic extrude. PVC has become the world's second-best-selling plastic, generating billions of dollars in sales each year. In the 1950s, the most important innovation came when irrigation pipe & Electrical Conduit Pipe made from rigid Poly-vinyl Chloride were introduced. PVC pipe is recognized as a less expensive, non-corrosive and more easily installed alternative to the metal pipe. In terms of revenue generated, it is one of the most valuable products of the chemical industry. Around the world, over 50% of PVC manufactured is used in construction. It is easily expandable up to any level in a short time, depending on the demand.